I have dived a number of sites around the southern parts of Western Australia but I do have a few favorites that have been the focus of a lot of my underwater photography. These include the famous Busselton Jetty and the wrecks of HMAS Swan and HMAS Perth along with a few sites around Perth that I keep going back to. You can find a bit more information on these sites in the panels below and, although some information may be a bit outdated, it should give you a bit of an idea on the particular area. The Ammunition Jetty can be reached by turning down Nyyerbup Circle off Cockburn Road and then a short walk along the path to the beach. Since the ammunition jetty was opened to the public it has become a popular location for fisherman and divers as well as sun seekers. In the summer months the beaches are full of people who come here for the calm waters and barbecue facilities that have been set up just behind the dunes. There are toilets here as well as ample parking and a shower has been made available at the beginning of the pier that is useful for a rinse after exiting the water. The only down side to this site is the walk from the car park however if you take your time it is only a minor problem. Entry is from the beach on either side of the jetty and it is recommended that you stay under the pier throughout the dive to avoid fishing lines, which are hanging down from above. Sand dollars are probably the first thing you will see at this site as they are here in their hundreds on most days but as you progress along the jetty you will find many small Blennies hidden in the tiny holes of the piers as well as numerous octopus. Take care as the infamous Blue ring Octopus can also be found here and they can kill in minutes. Other creatures that you may come across include Nudibranchs, crabs and Sea horses as well as huge schools of yellowtail and we have even found juvenile Bat Fish sheltering amongst the pylons. Visibility is normally low but on occasions it can be up to ten metres and it is at these times that a wide-angle lens can give some good results with the beams of light that filter through the columns. At other times macro is the best bet. Even if photography is not on your agenda this site can be very interesting as we have come across huge jellyfish here with schools of juvenile fish darting in and out of their long tentacles. Unfortunately the bottom is sometimes littered with rubbish tossed over the side by people above and we have seen things from tin cans to the occasional chair. This is also a common site for dive schools so it is a good idea to dive here as early in the day as possible to avoid the traffic. The Rockingham Wreck Trail is a collection of small boats, planes, tyres and even an old play swing with a series of ropes linking them together in a depth that ranges from about 9m down to about 18m. It lies just out from the Rockingham Foreshore opposite the dive shop and access is from the car park by walking down the steps to the water. The float that marks the start of the diving trail can be seen quite clearly from here and occasionally is adorned with a diving flag. Once you have made your way to the sand bar that runs parallel with the beach just swim to the float and descend. Follow the rope to the first wreck, which is now little more than a few spars sticking out of the sand. The ropes will lead you east to the second wreck which is much more intact and home to many fish species as well as tubeworms and sponges. From here just follow the ropes until you come across the other two wrecks then make your way back along the other side. (about 45 min.). The site has been set up and is maintained by local divers and dive shops and all the wrecks are linked with a series of ropes, which make navigation through the sometimes-bad visibility an easy task for any diver. The site has become a popular site for dive schools so it is recommended to visit here early in the morning before the silty bottom is disturbed too much. Although not one of the best sites along local waters it can be dived almost all year due to it’s protected location and offers a large variety of marine life. 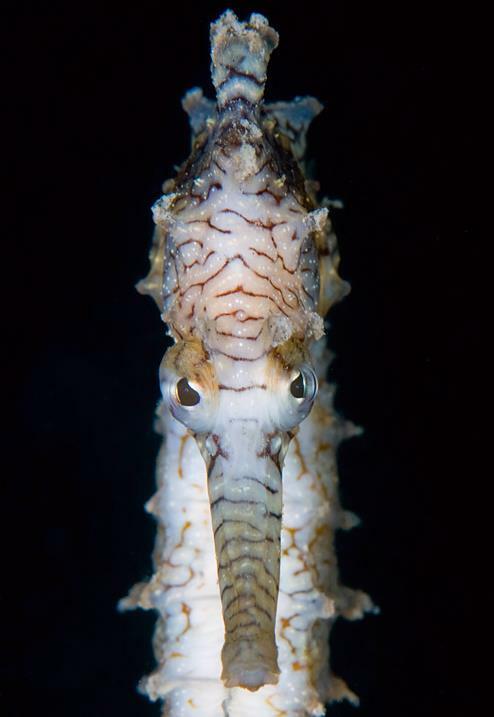 Sea horses can be found on the wrecks and along the guide ropes on almost every dive and many species of fish make a home of the wrecks. Other creatures found here include sponges, soft corals and a few varieties of Nudibranchs. If great visibility, reefs and swim throughs are what you are after then give this site a wide berth however, if you have a camera or just have an interest in marine life then take a look and you should not be disappointed. The Rockingham wrecks dive site has all the facilities one could want including parklands where a family picnic could be had as well as toilets and a dive shop just across the road. The old Robb Jetty isn’t really a jetty anymore and apart from a few short concrete posts at the shoreline you would not even know it was here. To reach this site you need to park your car at the first car park along Robb Rd. from the Mctaggart Rd. end and walk through the old cattle yard, over the path and then over the sand dunes to the beach. It is a bit of a walk but fortunately there is a bench half way for the unfit like myself and the other problem is the chance of you car getting broken into so don’t leave your valuables in the vehicle. Having said that we have dived here many times and never had a problem. Upon entering the water swim out from the concrete posts until you come across the cut-off pylons of the jetty. It is sometimes easy to miss so it may be easier to swim out a little closer to the statue (you will see what I mean) for about 150m then head south until you reach the site. All that is left are row upon row of pylons that have been cut down. Some are only a metre or so high while others can be up to 3 metres but this site has lots of marine life and can get reasonable visibility as well. Moving out along the pylons you can expect to find Sea Horses, Nudibranchs, schools of Yellowtail and Bream as well as hundreds of Sea Cucumbers. 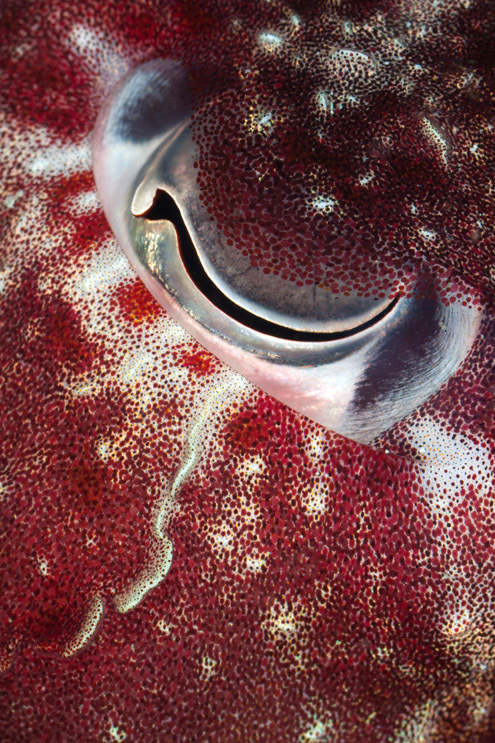 Other creatures that we find here on a regular basis are Octopus, Scorpion Fish, Dragonets and even the occasional Bat Fish. Many species of Leather Jacket inhabit the pylons and in the cooler months we have seen dozens of juvenile Port Jackson Sharks along the bottom. The site is not often visited and we have dived it a few times without even seeing another diver but don’t let this turn you away as this is a good shore dive for the photographers out there. Although not really a local dive the Busselton Jetty can be done as a day trip, which we do on a regular basis. Construction of the Jetty commenced in the 1860's, but over the next thirty years was extended many times because of a build-up of sand and is now about 1.8 kilometres long. It was first used for the loading of supplies onto whaling ships and then later to load timber from the surrounding forests. A portion of the original jetty was destroyed in the 1980's by a tropical cyclone and in December of 1999 a fire (believed to have started from a cigarette) wiped out 70 metres of the structure near the end. It was an all night effort to save the jetty and fortunately the best area for diving was spared yet there is extensive repair work required and it is hoped that this premier dive site is not left for nature to reclaim. The jetty used to be accessible by a small train that travelled the length of the jetty in daylight hours but this is no longer in service so unless the long walk is what you are after you have to dive this site by boat. The best area is the last 150 or so metres as it is here that you will find the most prolific congregation of marine life. 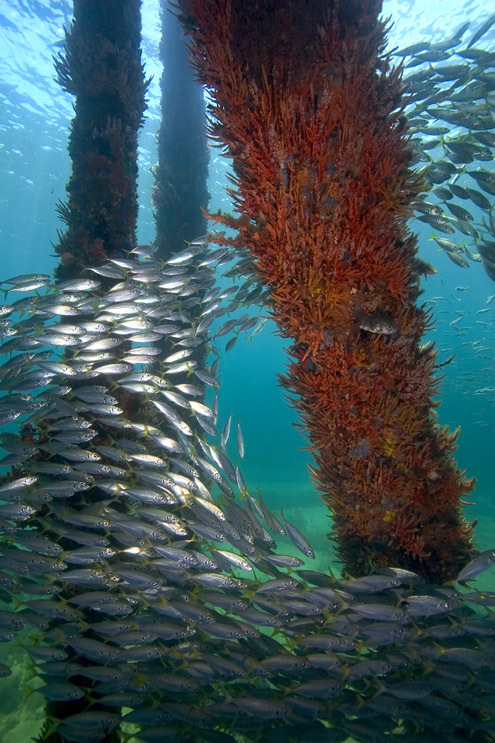 Huge schools of Yellowtail, Snook and Skippy can be found meandering through the pylons, which are covered with ascidians, soft corals and sponges and with visibility normally in excess of 15 metres the environment can take on the appearance of a lush forest. Almost every type of fish you would expect to find in the bay can be found under the protection of the jetty and there was even a visit by a huge Queensland Groper that made a home amongst the pylons for a couple of summers. Because of the generally calm conditions, the jetty has become a popular and safe night dive with the only danger being the quantities of fishing line in the area. (Take a knife). It is at night that the masses of Telesto coral come to life with their white polyps fully extended and the observant diver will find Hermit Crabs, Octopuses and a variety of Nudibranch. This one can be a little hard to find but is well worth a look. 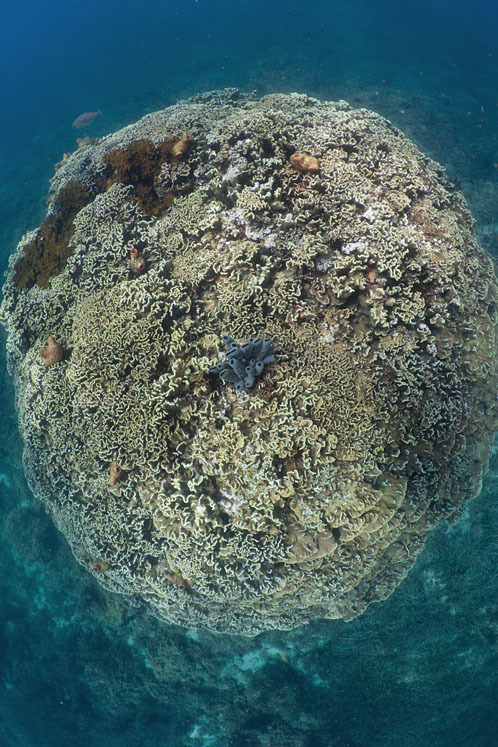 It is basically a large coral bommie that stands out above the surrounding limestone reef to a height of around four metres and a diameter of around eight metres. It can be done as a shore dive with a bit of a swim or from a boat but I don’t think anyone does it as a charter. Check with the local dive shops to get directions or email me and I will send you an old map I have. The Bommie is surrounded by reef and is home to hundreds of fishes and other marine creatures. Most of the time the visibility is really good as the bay is sheltered from the ocean swells and it is a good site for both macro and wide angle. Schools of Bulleye and Oldwives hover around the bommie and Leatherjackets, Moonlighters and wrasse hang around under the ledges. Around the rest of the area you can find a few smaller bommies as well as limestone reefs broken up by patches of clean white sand. Here you will find Nudibranchs, Starfishes and the occasional Octopus and Cuttlefish as well as colourful sponges. It is not uncommon to see huge Sampson Fish shoot by and a few years ago I saw one that looked well over 1.2m long. On the way out, if you are doing it as a shore dive, you will pass over a small patch of reef that is separated from the main reef by a line of sand. It is here that we have occasionally found juvenile Port Jackson Sharks no more than a few inches long and if you sneak up a shot can be had with macro gear. This can also be productive at night although a lot harder to find. 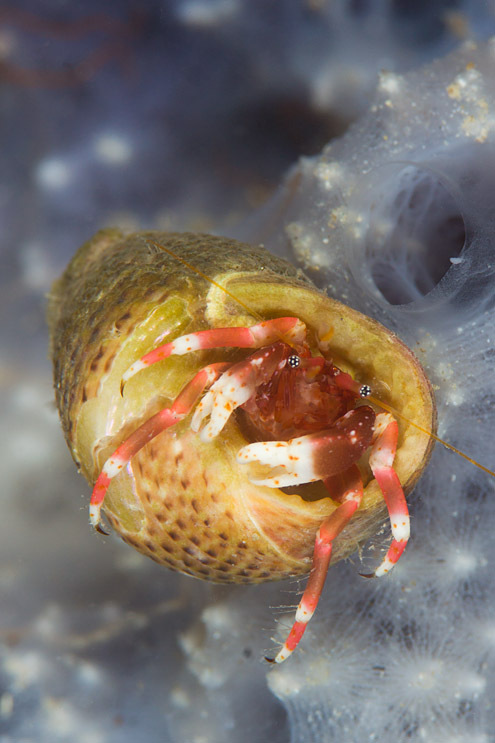 Small shrimp and crabs that shelter in the coral during the day come out at night and cover the bommie, Great macro. There are three main purpose sunk wrecks in Southern Western Australia at the moment which were all put in place for the use of divers. These wrecks are all accessible either through dive shops or with private boats providing the correct permits are acquired. HMAS Swan was sunk in Geographe Bay in December of 1997 and was the first of the three to be relocated to the ocean floor. These days there is an abundance of marine life on, in and around her with many schools of Bulls Eye to be found throughout the wreck. It is a site that gets some real good visibility from time to time and is great for photography on these days but if you want to shoot the bow I suggest and afternoon dive so you get the sun behind you. The Swan was sunk in an almost upright position and is intact apart from the missing main gun. Next to come was HMAS Perth which was sunk in King George Sound, Albany in November 2001. This is an impressive wreck coming in at 133 metres and sitting in about 36m of water. The amount of growth that developed on this wreck is amazing and the fish life is stunning. The Perth has not been sunk in the clearest water in the Sound which disappointed many people but it is still a site well worth visiting. 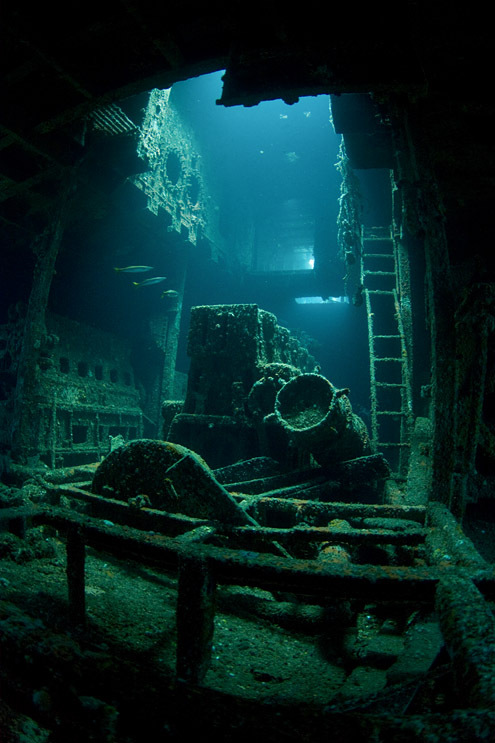 The last of the three is the wreck of the Lena. This vessel was captured by HMAS Canberra after it was found fishing illegally for the Patagonian Toothfish in Australian waters. She was chased for a few weeks and then brought back to Western Australia and eventually sunk as a dive wreck in 17m of water off Bunbury. She sits on a sandy bottom with generally clear waters and is a great wreck for the photographer. If you have any queries or need any info about any of the images on this site or my underwater site please feel free to contact me.